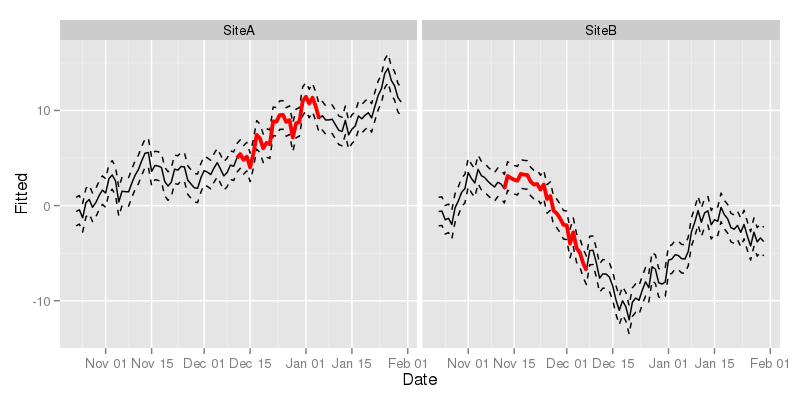 I recently coauthored a couple of papers on trends in environmental data (Curtis and Simpson, in press; Monteith et al., in press), which we estimated using GAMs. Both papers included plots like the one shown below wherein we show the estimated trend and associated point-wise 95% confidence interval, plus some other markings. The coloured sections show where the estimated trend is changing in a statistically significantly manner, i.e. where a 95% confidence interval on the first derivative (rate of change) of the trend does not include 0. That particular figure and the others in the papers were drawn using the lattice package (Sarkar, 2008), but I could just have easily used ggplot2 (Wickham, 2009) instead. I was recently asked via email how I produced the figures in the paper. Rather than just reply to that email, I thought I'd knock up a quick post for my blog to show how it was done. 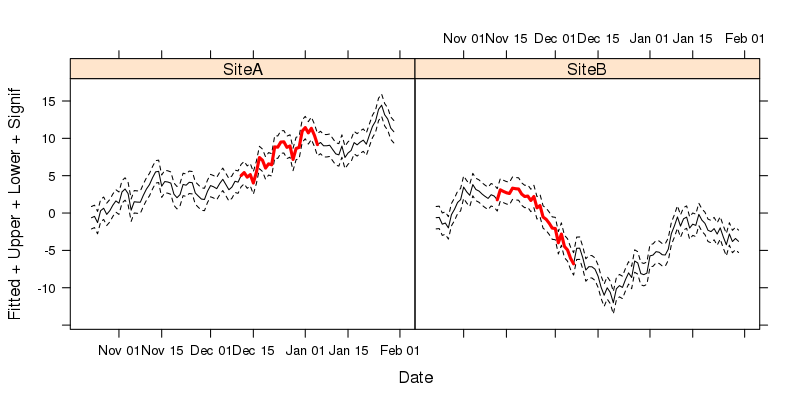 Fitted, a numeric vector holding the trend estimates from the model. Signif, another numeric vector that will contain the same values as Fitted, but only for regions that are important or significant in some way. At first this is initialised with NAs. In the papers we had two variables, Increasing and Decreasing, which contained the values of the estimated trend (i.e. duplicated Fitted) where the trend was either increasing or decreasing significantly. The general principle is the same, however; the non-NA locations will be indicated by a thicker line width and hence we duplicate the Fitted values only for the sections that are interesting. The transform() line just adds some dummy confidence intervals to data frame, creating variables Upper and Lower. In the papers these were approximate, point-wise 95% confidence intervals computing using the standard errors of the realizations from the estimated trend, as returned by predict() with argument se.fit = TRUE. The last section in the code block just selects two random points within the interior of the each time series, which we then use to mark the start of the "interesting" period. This and the next 25 values in each time series are used as indices to copy into Signif the corresponding values from Fitted. With that done, we can start plotting. I'll show the lattice version first and then the ggplot one. The formula used describes the plot: Fitted + Upper + Lower + Signif ~ Date | Site. The variables" we want to plot are all passed to the left-hand-side of the formula, with Date used to the right of ~, indicating the x-axis variable to be used. The last part of the formula indicates conditioning on Site and is what instructs xyplot() to facet the resulting plot into separate panels for each Site. The parameters lty, lwd, and col.line all control the aesthetics of the plot, and are specified in the order that the variables appear in the formula. Hence we use solid lines for Fitted and Signif and dashed (type 2) for the confidence intervals (Upper and Lower). In a departure from base graphics, it is the col.line argument that is used to specify the colours used for lines drawn in the panels. With ggplot2 the key is to notice that each of the lines we want to draw on each panel can be drawn using different geom_line() layers, added sequentially to the plot. With each additional layer, we can override the default mapping by changing the y data in each layer using aes() within the geom_line() call. The code to create the plot is shown below. The first line sets up the basic ggplot object with a mapping and a data object, to which we add a geom_line() layer (line 2). Note that here we don't specify any arguments to geom_line(), so it picks up defaults from the base object created in line 1. In lines 3 to 5 we add additional geom_line() layers, but now we need to override the mapping of variables to axes on the plot, which we do by updating the mapping. We only need to change the y data used for each layer; the x data are taken from the base object created in line 1. Notice how we specify attributes for these lines outside the aes() calls? This controls how each line is drawn. The final line in the code chunk uses facet_wrap() to split the data up by Site and draw a separate panel for each of Site. I don't think any of this is particularly revelatory, but, as someone did ask me how it was done, hopefully some readers will find this useful. Happy plotting! Curtis, C. J., and Simpson, G. L. (in press). Trends in bulk deposition of acidity in the uk, 1988–2007, assessed using additive models. Ecological Indicators. Monteith, D., Evans, C., Henrys, P., Simpson, G., and Malcolm, I. (in press). 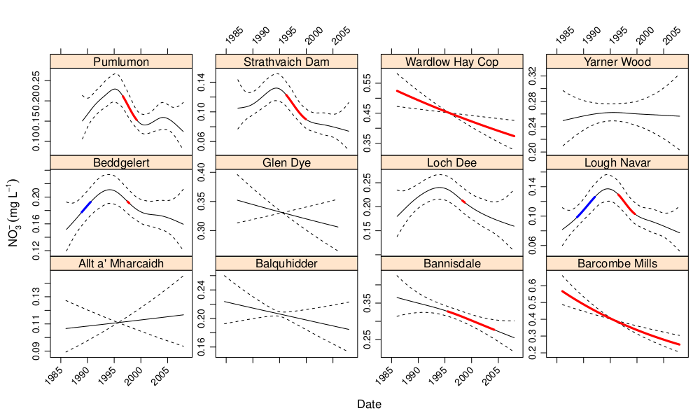 Trends in the hydrochemistry of acid-sensitive surface waters in the uk 1988–2008. Ecological Indicators. Sarkar, D. (2008). Lattice: Multivariate data visualization with r. New York: Springer Available at: http://lmdvr.r-forge.r-project.org. Wickham, H. (2009). Ggplot2: Elegant graphics for data analysis. Springer New York Available at: http://had.co.nz/ggplot2/book.